Sixteen ladies d’un certain age, in Holyport once more, for the British Masters – with Boodle in attendance, who did his best to fit in, age-wise, by heading straight for the heater in the dedans even though it meant leaving his mistress shivering at the back. Participants were honoured with not just one, but two, World Champions to do the marking. It was noticeable that no one dared to make a squeak at either Rob or Claire’s efforts, even when Rob called Chases before the ball had made its second bounce (but I guess you don’t get his number of RT titles without knowing where a ball is going to land….). Events kicked off on Friday with the first round, where matches went with the handicap rankings – well-fought but no surprises. The match between Candida Nicholls and Chantelle Harding was a hum-dinger, however, going to three tenaciously fought sets, with Chantelle playing superbly in the second set to take it 5/6, but unable to maintain momentum for the third as Candida swept to victory 6/3 5/6 6/2. 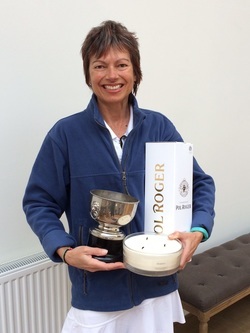 Pam Tomalin had the dubious honour of playing twice on Friday, against Lucy Davies, and then in a second round match against Linda Sheraton Davis – luckily for the rest of us, she ran out of steam against Linda, which meant she could concentrate on feeding us for the rest of the weekend. 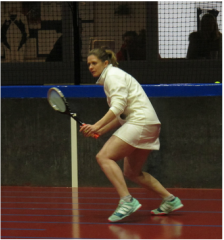 Carolyn Armstrong-Smith in her first round match on Saturday took time to get going (losing the first six points straight off), but then engaged in an excellent tussle with Rebecca Kashti, who eventually won with two dedans forces in the final game, 6/4 6/3. ​Saturday saw three of the four second round matches which brought in more new blood (we’d seen Pam go out to Linda Sheraton Davis on Friday) At this point it became obvious that two of the ‘regulars’ were playing their best tennis – Lucy Hutchinson and Candida Nicholls were both on fire. Lucy methodically saw off Gabrielle Smart Fourquet; her steady low ground strokes were delivered with ne’er an error, and Gabrielle was swept from side to side, losing 0/6 1/6. And Candida demolished Linda Fairbrother, with a string of beautifully placed dribble serves, backed up by powerful shots that forced errors galore from Linda, who couldn’t find anything in her game to trouble her faultless opponent. Both were laying good chases and the games were long and strenuous, but Candida was winning the big points, and sailed through, 6/2 6/2. 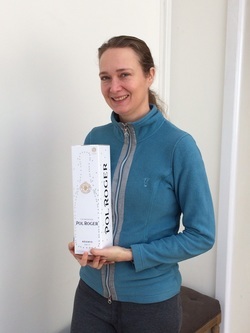 Karen Pearce from Cambridge also hardly raised a sweat against Rebecca Kashti, bruising her way through the points with a very consistent game, and even when wrong-footed somehow able to scramble the last essential shot back. Rebecca tried to force errors with some perfect shots to the tambour and grille, but there weren’t enough of them, and Karen won convincingly 6/2 6/1. ​Now the big guns started to appear in the third round. Lucy Hutchinson and Candida Nicholls continued to play out of their skins, and gave opponents supposedly way better than them a testing time. Lucy took on Penny Lumley, and though the score doesn’t show it, she really made Penny play and hung in for the rests like a champion herself. Her stated aim before the match was to get at least 5 points, a target well exceeded, and even when she lost – many –points, it was never through lack of fighting for every one. Sometimes the fight was misplaced, however: Penny nicked a neat shot into the grille, which then bounced out into hazard. So neat was it that Lucy failed to notice it had gone in the opening and called: ‘Hazard Half a Yard!’ ‘Good try’, was the marker’s response…. Penny through, 6/0 6/0. Candida played Tiff Fielden, and fought tenaciously. Her serving was not quite as tight as against Linda, so Tiff had plenty of opportunities to cut down on the ball with her trade-mark stance and put it into far corners. But some of Candida’s efforts were near-miraculous – such as her attack on a Chase worse than 2 in the fifth game, when she played four strokes in a row that were going to beat the chase until eventually Tiff cracked and put the ball in the net. By the second set, Candida was still getting game points but unable to capitalise on them with Tiff just more consistent with a greater variety of placing. But things were staying more or less equal up to 3/2 to Tiff, at which point Candida started to look out of oomph. Tiff upped her serves, and rolled on to take the set and match 6/1 6/2 – a fine effort from Candida. ​There was another fierce contest between Karen Pearce and Elvira Campione. Again the score doesn’t do justice to the battle, with Karen chasing down every ball, getting to deuce in many games and to game points too. She was blocking grille forces, running from side to side, keeping the rests going, but nearly always she would eventually put back a ball just a bit too high or a bit too short, and then Elvira would elegantly finish off the point with a beautiful low stroke dead into a corner. It was a great contest, finished off typically with a shot to the grille by Elvira, followed by a great serve: 6/1 6/0. The final match of this round was between Linda Sheraton Davis and Alex Garside – again with Linda hanging in on the points against a superior opponent. By playing safe and steady, Linda put more pressure on Alex than one might have expected, winning quite a few of the long rests, and indeed two games in the first set. in the second set, she began by getting ahead 1/0, but at this point, Alex cut out some of her errors and piled on the pressure. Linda decided to try some cunning, and began playing ‘ugly’, with some very successful lobs and topspin returns, and was more or less giving as good as she got for a while. But Alex’s quality told in the end, and she won 6/2 6/1. ​In the semi-finals, then, Penny met Tiff, and Elvira met Alex in two excellent matches, though with wildly different scorelines. Penny and Tiff’s match was a fine display of elegance where neither ever looked off-balance or wrong-footed. Tiff played extremely well and with great belief, but couldn’t win the vital points, with Penny always having one more shot to bring out, or delivering a morale-sapping deadly cut stroke to steal an apparently impregnable chase. Tiff tried everything – dedans forces, more severe cut on her ground strokes, shots to the tambour base, but to no avail. The winning shot of the first set was typical – a ground stroke into the corner under the grille from Penny, which hit the nick and then died in a flurry of angles. At the start of the second set, Penny added injury to insult with two successive shots high off the tambour which both hit Tiff full in the chest. By this stage, Tiff was in the position that many of her winning points were the off-shots or the framed shots, that took Penny by surprise; while her ‘best’ shots were swatted away for winners. She continued to fight to the end, but Penny swanned on, to win 6/0 6/0. Elvira against Alex was a very different and tight contest. It began as it continued – a fiery first game with endless rests, which (despite a double fault) eventually went Elvira’s way. Just about every game went to deuce, with just the occasional wobble from Elvira giving Alex the opportunity to hang in for 3 all. At this point Elvira began to squeak a lot more under the pressure, as she stretched for the shots. Her sounds of anguish intensified, with both players following a pattern of two or three superb shots, followed by two or three very loose ones. But Alex began to pull away, and though the deuces continued, she was winning the games and took the first set 6/3. She started the second set looking re-energised, and romped through the first game to love, and was 40/0 up in the second. At this point Elvira hunkered down, and snatched the game from under Alex’s nose to make it 1/1. We watched in the dedans to see whether Elvira had indeed seen off the newly-energised Alex to bring back the erratic Alex. It seemed so, with Elvira’s lovely double-handed backhand now working to devastating effect, her error count down, and Alex now muttering to herself as she began to swipe at Elvira’s serves and volleys. Elvira evens up the match, winning the second set in style with a forehand volley smack into the Winning Gallery corner. Alex began the third set with five hug slaps on her rump. This was obviously a successful tactic, as she promptly laid two excellent chases and won the first game. There were fewer deuces in this final set, but far more self-recriminations from both players whenever they lost a point. All was even stevens up to 2/2. But then Elvira got on a roll, against an Alex who looked tired and somewhat flat-footed, and took it to 5/2. Alex fought gamely, and converted 0/30 against her to 40/30 in her favour. But that game point went begging, and so did the next at Advantage to Alex, defending Chase Better than 4. Back to deuce, and then with the advantage (and serve) to Elvira, Alex could not beat Chase Worse than 1. So Elvira through to the final, 3/6 6/1 6/2. ​And what a Final it was – Elvira gave it her all, and it was a thrilling match even if the result was the expected one. From the start, Elvira obviously had a strategy of going for broke for everything, with huge ground strokes, especially if given the chance to hit high and down. And she was rewarded with the first game; 1/0 to Elvira. My goodness, we were all excited in the dedans! The second game saw more of the same – deuces and ads galore, with Penny frequently out-powered, unable to pick up the low ferocious strokes. However, after seven minutes of play, Penny finally evened up the score. After that excitement, a more normal service was resumed, as Penny won a love game, beginning to pick up more of Elvira’s bullets. But Elvira was still attacking fiercely and she won the next game to keep things level, 2/2, and then the next game to make it 3/2. Could this really be happening? No – from then on, things more or less went Penny’s way, as she reeled in the games. Elvira was not making it easy, but Penny was relentless and the score moved on to 5/3 to Penny. The next game gave Elvira two game points, but she couldn’t convert them, and after three deuces, Penny took the set 6/3. From then on, it was all Penny. Elvira looked tired, as well she might do, having given 110% (yes, I know you can’t do that….) in the first set. Her high wall serve had slightly less penetration, and she began to make unforced errors in the rests. Penny by now was coping fine with Elvira’s best shots, not just returning them but hitting the corners or just missing the tambour at will. Shrieks of agon-ee and a running commentary on her mistakes from Elvira as the games rolled away from her, and she could no longer put the same power on the ball. At 5/0, Penny had two match points. The first went begging, but at 30/40 a wearied Elvira put a backhand into the net, giving Penny the match and the title once more, 6/3 6/0. It was a treat of a final for all the spectators. First and second round losers in the Singles entered the Plate Handicap Doubles, making four pairs. 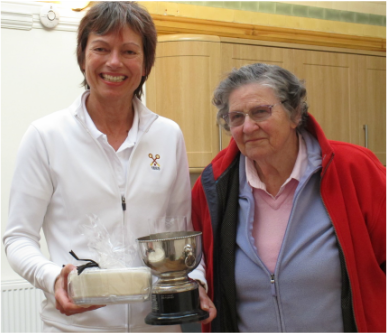 The final was between Sarah McGivern and Pam Tomalin against Carolyn Armstrong-Smith and Linda Fairbrother. It was a game of anti-climax after the masterful display we’d all just enjoyed in the Singles final. But a nail-biter all the same. Games crept up in tandem, with rather too many unforced errors from everyone apart from Sarah, who played her usual totally reliable shots, unless the ball was smacked at her three or four times in a row, and then even she crumbled. Linda was failing to find her form, unable to execute her trademark return of serve corner shots against steady serving by Pam, but luckily Carolyn was in better shape and kept the show on the road. The score stayed level up to 6/6. 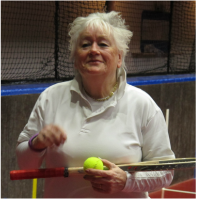 Then Linda finally played a few good shots, Carolyn (who was alternating between finding the net and hitting brilliant smackers) also upped her percentage of success, and by keeping the ball away from Pam’s far-too-efficient racket, Linda and Carolyn edged a win, 8/6. Our thanks to Holyport for hosting this always enjoyable tournament, and to our (literally) world beating Markers, Rob and Claire Fahey, with the help of John Evans. We’re grateful to sponsors Wineflow, the ladies who provided delicious food over the weekend, and of course to Katy Weston who organised the tournament with the help of Pam Tomalin.